Aessent Technology today unveiled its AES100 micromodules, based around the Cypress FX2 microcontroller and offering high speed USB capability (480Mb/s) on tiny 0.6” 24 pin sockets. The micromodule gives access to ports A and B of the microcontroller. All of the 8 bit GPIF interfaces are accessible as well as the I2C lines. 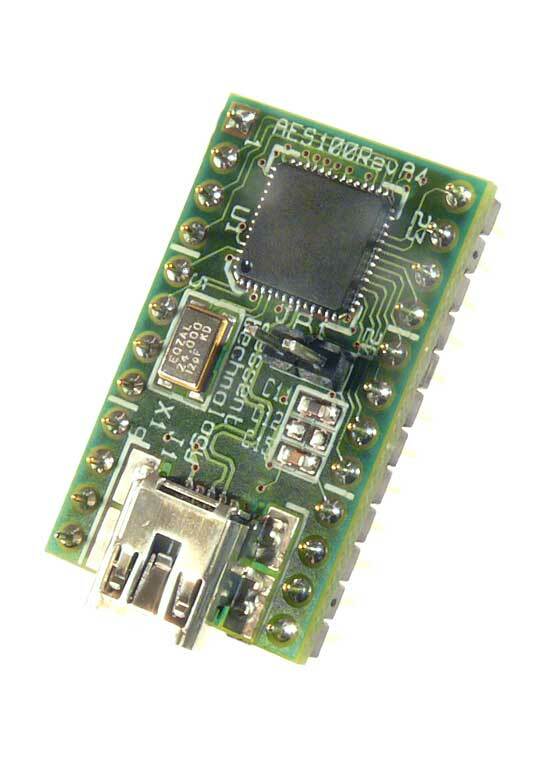 The module is powered directly from the USB port or from an external 5V power supply and is programmed over the USB port without the need for expensive external tools. Programs are downloaded to the micromodule using free and/or open source tools available on Windows, Linux or Mac OS. Firmware can be run in RAM for testing or saved in the onboard EEPROM, which can can be easily reprogrammed insitu without the need for a separate programmer. Shop in confidence: we accept payments from Paypal and most major cards.